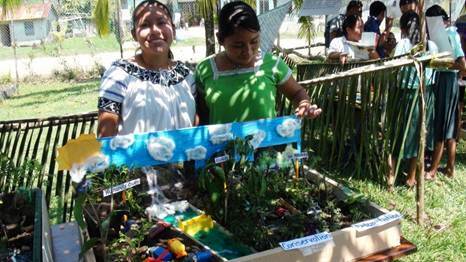 (April 23, 2012, Belize) – The University of Belize in Toledo hosted a fair in observance of Earth Day 2012, under the customized theme "Humanity Owes Ecology an Apology!" on Friday April 20th. 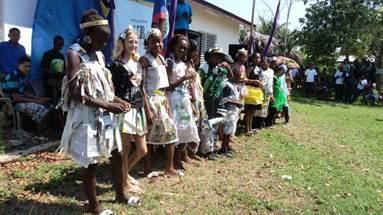 Booths at the fair included organizations like Tide, Plenty Belize, Belize Red Cross, Fisheries Department, Sustainable Harvest International, the Ya’axche Conservation Trust, as well as a joint UNDP / Government of Belize booth. University students exhibited group projects illustrating the theme, while primary school students of the Toledo District participated in a "Trash Fashion Competition", as well as poster and poetry competitions. The United Nations Development Programme (UNDP) project "Applying MDG Acceleration Framework: Addressing Governance Bottlenecks to Achieve Water and Sanitation Coverage in Belize", being implemented by the Ministry of Labour, Local Government and Rural Development (MLLGRD) / National Emergency Management Organization (NEMO), was highlighted at the fair. The project is geared to contribute to poverty elimination by investing in people and aims at enabling improved good governance practices at national and local and non-state institutions like the Ministry responsible for rural development and local government, and the local water boards. 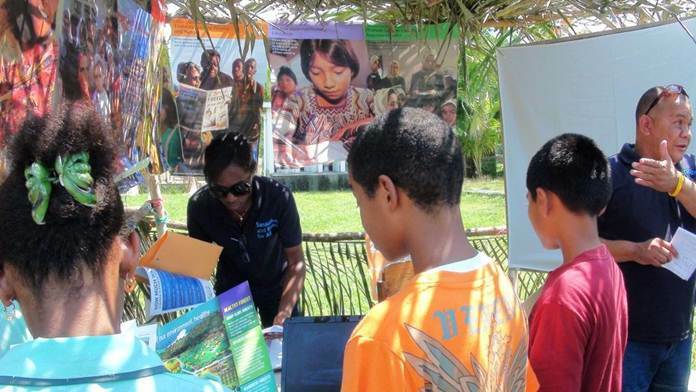 Representatives from the Ministry and UNDP hosted over a hundred visitors including primary school and University of Belize students and teachers, and members of the public at large at a booth, where information was shared on the Millennium Development Goals (MDGs) and on MDG 7 – ensure environmental sustainability – in particular. The water governance project expected outputs: enhancing the capacity of Water Boards, strengthening of ownership of water systems and sanitation services, and establishment of adaptive management support to water boards and other national stakeholders were also shared with visitors to the booth. The interactive and informational activities included quizzes, games, posters, distribution of fact sheets and video presentations, which shared information on water, sanitation and hygiene (WaSH); water governance proposed legislative amendments; progress on the MDGs; and motivational videos promoting public mobilization for conservation, etc. The Ministry’s National Rural Water Supply and Sanitation Coordinator, Hilbert Lopez, and Rural Community Development Officers and UNDP have also recently participated in the World Water Day 2012 Fair in Belize City and have implemented targeted presentations at rural schools and other venues to build awareness of the rural water management and proposed legal amendments that will soon be tabled for approval by the Government of Belize. For high quality video clips or photo, media houses can contact Marta Hendrikx, Communications Associate, United Nations Development Programme, at 822-2688.